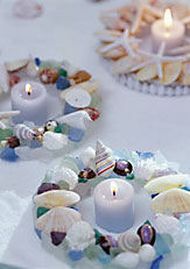 Here’s how to make a seashell and beach glass candle ring for your home or cottage. Each candle ring will take about one hour to complete. 1. Wash and dry shells and sea glass if needed. 2. For formal look (front), glue pairs of shells to foam wreath, opposite one another. Begin with largest shells, moving to smallest. Fill spaces between shells with sea glass. 3. For more casual, natural look (left center), glue a favorite large shell to wreath, then surround with smaller shells and sea glass. Continue until entire top of wreath is covered. Glue sea glass to inner and outer foam edges. 1. For starfish ring (top), paint turrid shells white if desired; let dry. Glue shells around wreath edge, close together with points up; let dry. 2. Glue large shells to top of wreath, facing one direction and slightly overlapped. Glue starfish to top of shells as shown. Let dry.